Oops - we don't appear to have a video for the GT-S80. From business cards to multi-page A4 documents, leave your scanner to take care of business while you get on with other jobs. Scan up to 75 originals in one batch at very high speeds and on both sides when you need to. This new scanner is the perfect way to set up your own high quality office document management system. Discover the latest word in fast, cost-effective business scanning. 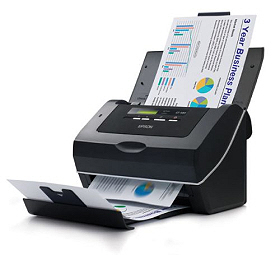 Digitise all your office information at up to 40 ppm and 80 images per minute at the push of a button. Leave the scanner to do the work, safe in the knowledge you'll get trouble-free scanning with features including ultrasonic double feed detection, batch separation and blank page removal. With Epson ReadyScan LED technology you can start scanning in an instant, but you'll use a lot less energy in the process.